“SUBMARINE COMMANDER” By Rear Admiral Ben Bryant. 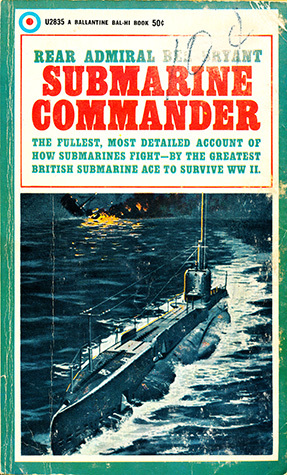 During World War II, Commander Ben Bryant captained three different British submarines; P-211, HMS Sealion and the HMS Safari. He took part in the grim Norwegian campaign surviving the hazards of German depth charging. Bryant landed and retrieved British agents in occupied Europe and went on several Mediterranean war patrols, preying on Erwin Rommel’s supply lines to North Africa. By the end of 1945 he was the greatest British submarine Ace to survive World War II, sinking 32 enemy ships. Bantam Paperback edition. 259 pages, 5 maps, 6 sub-attack diagrams, one British S-boat diagram and many illustrations but no photos or index. Marked cover as noted in book photo above.